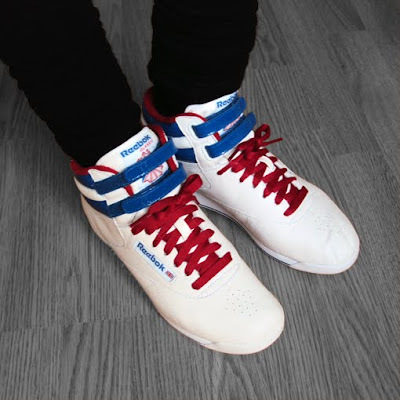 My new, very Union Jack-inspired, Reebok trainers. Only £13 at York Designer Outlet. Actually, they were £25, but there was a "get a 2nd pair for £1" offer, so Becky and I got a pair each and split the total cost. A great deal or what? 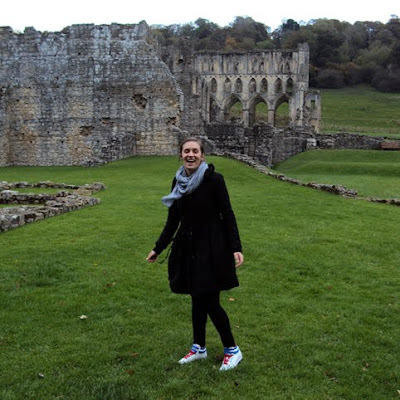 Naturally, the best choice of footwear to enjoy a walk at Rievaulx Abbey. Μου αρέσουν πάρα πολύ αυτά τα παπούτσια!!!!!!!! cool picture girl and of course cool shoes!!!! the second photo is awesome! Hahahaha. You look absolutely delighted to be tromping around the British countryside in your retro sneaks! Teleia, teleia papoutsakia...mpravo po taxideueis! post more pics na xerostaliazoume ki emeis!!! Kisses! Thimithika twra ta outlets tis Aglias (o paradeisos sti gi) k den mporw, me pianei kati! those shoes are perfect...love them...we want more photoooos and wish you buy more cool stuff. tetia 8elo kego...idika ta ala sto proigoumeno post sou..totally girly..
Wow they are awesome, great deal! yes, I guess I've seen the same zara wedges here too! but don't you have them in black? oh my!you ve got the perfect smile here girl! cool outfit + great colors around you.. Very cool! Love the shape of your jacket.